Another A Beautiful World exclusive and from what I have read online all skin care junkies should be exciting! "LA-based BRAD Biophotonic Skincare has announced its launch in the UK, available from abeautifulworld.co.uk next month. Originally developed for private charter jet clientèle to protect against the skin concerns of frequent air travel, the natural skincare brand uses state of the art technologies and protects the skin against even the most harsh environmental factors. BRAD Biophotonic Skincare repairs and regenerates using only the purest natural ingredients. All BRAD products are produced using bio-fermentation, which not only prevents oxidation so maintaining the maximum potency and effectiveness of the ingredients, but also concentrates the nutrient value and increases the bio-availability of ingredients so they can be absorbed deeply into the skin. BRAD’s Biophotonic violet glass packaging protects the products against deterioration allowing only violet light to penetrate which continues to activate and energise the formulations extending their shelf life. " The news a few of us have been waiting for "British nail brand Ciaté is expanding its offering into colour cosmetics with the launch of LashLights this summer. Offering a collection of six highly pigmented colour mascaras, LashLights provide the volume and density of a classic mascara as thanks to the air whipped FlutterFOAMTM technology which delivers lash plumping, crumble-free colour with a feather light finish. Eyes are left brightened and widened and lashes are left with volume, fullness and definition. Ciaté LashLights are available in Electric (Blue), Serene (Purple), Famous (Pink), Surreal (Aqua), Nightingale (Navy blue) and Nymph (Green)." L'Occitane will be continuing with the theme of Brazil and launching a new collection - L'Occitane en Provence Aguape. "The simple beauty of Aguape, precious flowers that decorate rivers and lakes of the Pantanal region in Brazil bloom in clusters as floral bouquets on the water. Floating as decorations that nature provides on the rivers, they create passages to sailors and decorate their routes with flowers and scents. Eau de cologne Aguape incorporates the scents of the gracious flowers in a delicate scent in which water slides on the skin like Aguape on the water's surface. The fragrance includes extract of Aguape flower." From what have seen online it is a fairly expansive line up. A new MAC and fashion inspired collection will be coming our way this festive period. "MAC Cosmetics and Prabal Gurung are teaming for what they call an ultra luxe, deco-themed holiday collection. Price points for the 14-stockkeeping-unit, limited-edition offering will range from $20 to $70, a higher price point than MAC’s typical offerings. The line-up will be available in North American stores on Nov. 26 and will also be sold in select international markets in December." I am excited to see how this pans out. Now I have no idea if or when this Body Shop fragrance will hit the UK but when it does I will be first in line. The Body Shop Fijian Water Lotus collection oddly gives me visions of Hawaii and refreshing dips in the sea. If ever there was a scent to wear in the heat this would be it. Notes are said to include mandarin, lotus, Damascus rose, sea notes and litsea cubeba. One last skin care launch which is pretty pricey but the blurb does sound wonderful. "Advanced skincare brand SkinCeuticals has announced the launch of Resveratrol B E, a new night concentrate to target the visible signs of skin ageing. The product protects against accumulated skin damage and optimises skin's natural night-time processes by promoting skin's natural defence systems, reinforcing protection against free radical damage, strengthening skin's functionality against visible skin ageing and diminishing the appearance of visible skin ageing. The product helps to improve the appearance of skin radiance, elasticity and density. Key ingredients include: Resveratrol, a potent polyphenol antioxidant found in grapes, various berries, nuts and other plant sources which helps sustain healthy cell longevity by neutralising intracellular free radical damage and repairing the visible effects of accumulated skin ageing; Baicalin, which reduces intracellular inflammation and stabilises cell survival conditions; and Alpha Tocopherol, a pure form of vitamin E, which protects cellular membrane from free radical damage." 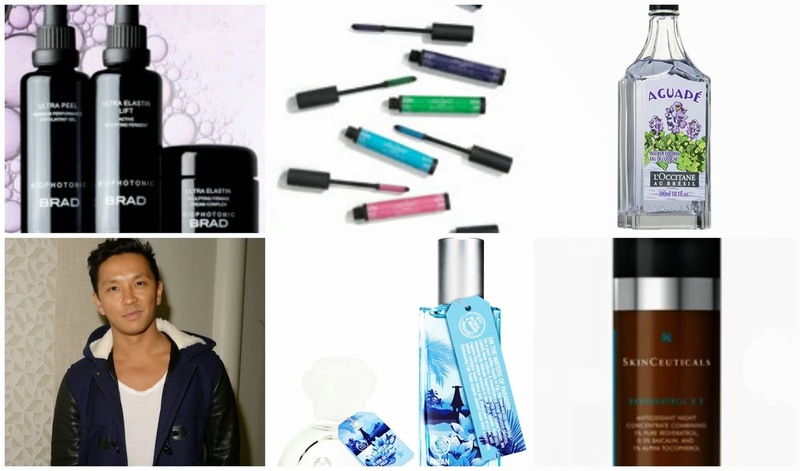 Lastly huge congrats to Jane at The British Beauty Blogger for teaming up with M&S for a limited edition beauty range. You can read more here - link.